Summary: As EU leaders are tested by the rise of populism, how can citizens and civil society organizations respond to these adverse trends? While new parties and movements are bringing fresh energy into politics that could benefit democracy and the EU, populism has become a defining political trend in the West. Xenophobic and Euroskeptic populist narratives from London to Istanbul are a major threat to liberal democracy, EU integration, and the rule of law. As EU leaders are tested by the rise of populism, how can citizens and civil society organizations respond to these adverse trends? 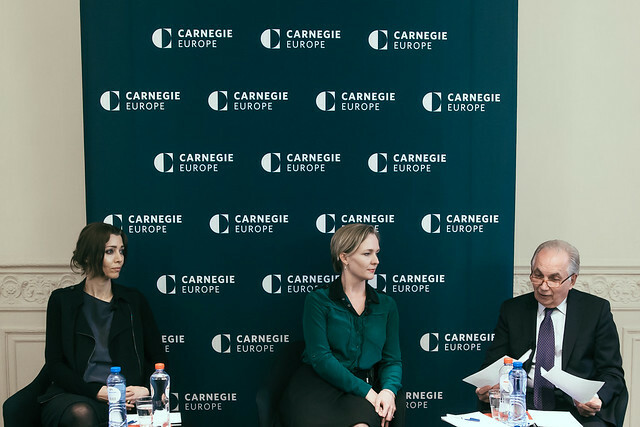 Carnegie Europe was delighted to host a discussion featuring Marietje Schaake, member of the European Parliament, and Elif Shafak, award-winning novelist and the most widely read female writer in Turkey. Marc Pierini, visiting scholar at Carnegie Europe, moderated. Marietje Schaake is a member of the European Parliament (Alliance of Liberals and Democrats for Europe, the Netherlands). Follow her on Twitter @MarietjeSchaake. Elif Shafak is an award-winning novelist and political scientist and the most widely read female writer in Turkey. Her latest book is Three Daughters of Eve. Follow her on Twitter @Elif_Safak. Marc Pierini is a visiting scholar at Carnegie Europe. Follow him on Twitter @MarcPierini.